How to convert M4A to WAV ? 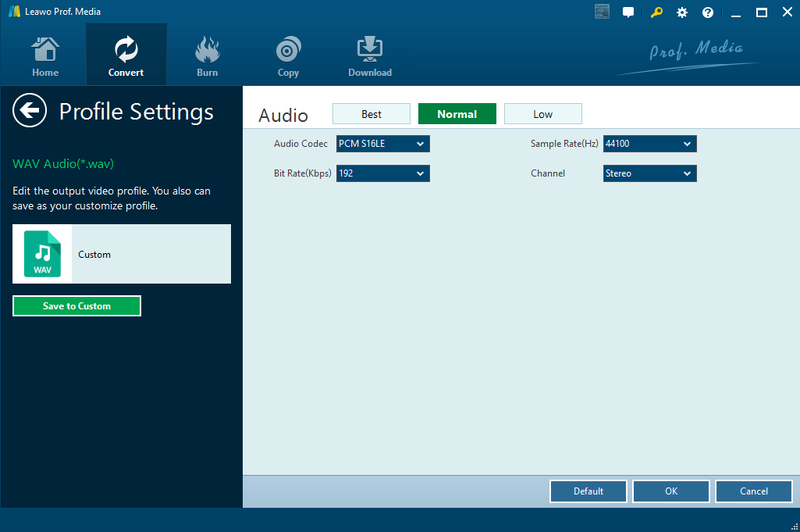 How to Convert CDA to MP3 with Effective CDA to MP3 Converters? How to Convert M4A to M4R without Quality Loss? How to convert iTunes music to zune player? How to Play iPhone Music through Car Radio? It is worth sharing that Leawo has recently upgraded its TunesCopy Ultimate to a more powerful program suite Leawo Prof.DRM, which integrates DRM video converter, DRM music converter, DRM audiobook converter, and DRM eBooks converter into the program suite. This one stop solution has benefited millions of users and it can achieve more when it combines with Leawo Video Converter. Here I would like to guide you to get familiar with this program suite in terms of M4A to WAV conversion. WAV is a widely used audio format, which is a standard digital audio file format utilized for storing waveform data. It allows audio recordings to be saved with different sampling rates and bitrates and are often saved in a 44.1 KHz, 16-bit, stereo format, which is the standard format used for CD audio. WAV files are most often seen on Windows-based computers for saving raw and typically uncompressed audio. 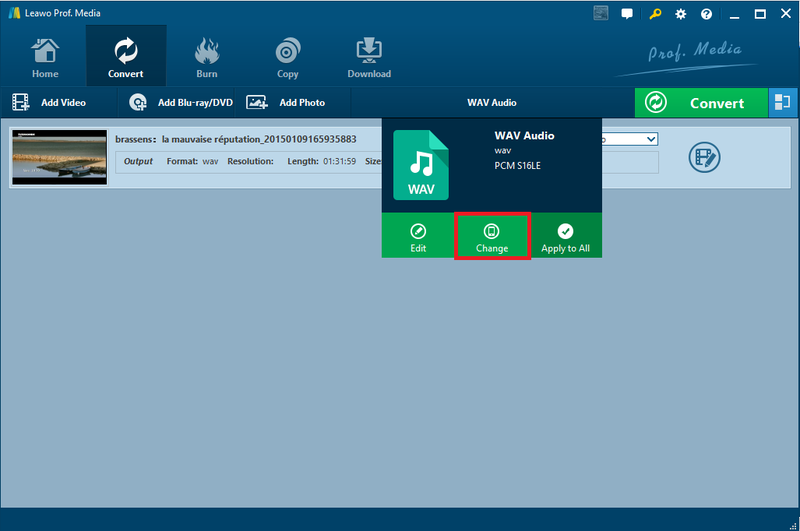 In order to convert M4A to WAV for streaming the audio on your Windows, you can leave the job to Leawo Prof.DRM and Leawo Video Converter, which will be absolutely good at DRM removal and file conversion. 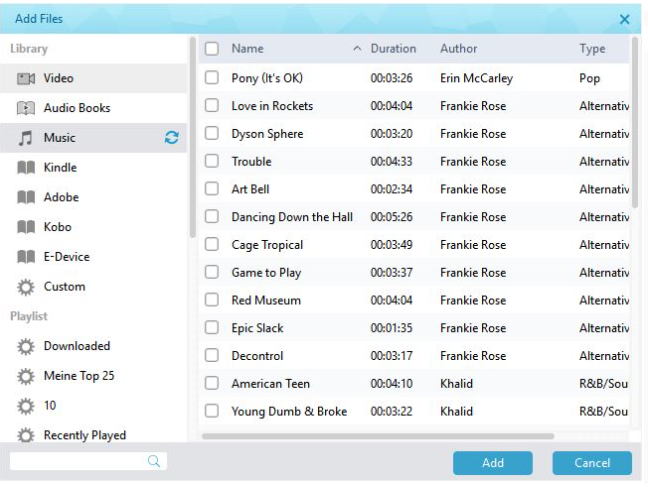 Leawo Prof. DRM, formerly known as TunesCopy Ultimate, has upgraded to a more powerful program suite, integrating DRM removal from iTunes videos, TV shows, music, audiobooks, and other eBooks. It is capable of removing DRM and convert DRM-free file to MP4/MP3 at 50X faster speed with original quality kept and channels/sampling rates/bit rates selectable. In this specific case, after you successfully remove DRM from iTunes M4A music, you can freely transfer the DRM-free iTunes music songs to any media players and mobile devices for unlimited enjoyment. The following guide will lead you to remove DRM first from iTunes M4A music using Leawo Prof.DRM. Step 1: Download and install Leawo Prof. DRM. Click to download and install this program to your PC. Step 2: Import the source M4A music to the Music module on the program. 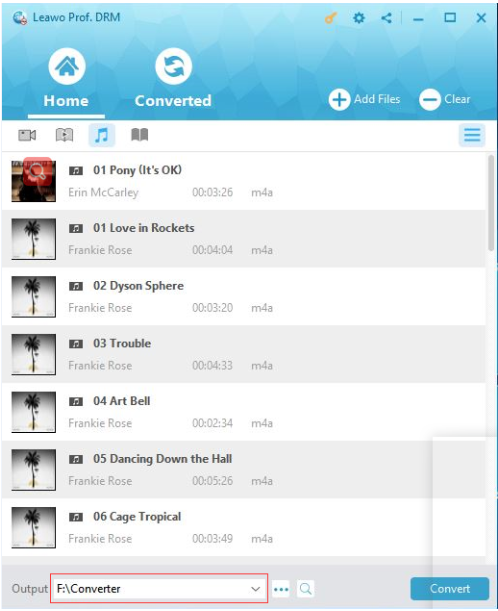 Click Add Files to import all your M4A music files here. Step 3: Set a folder to save the DRM-free music files. Click on the Output box and set a folder to save the DRM-free files. Step 4: Edit the audio parameters. Click the editing icon on the file to set specific parameters for the music files, such as sampling rate, bit rate, channel and so on. Step 5: Remove and convert the music file to MP3. 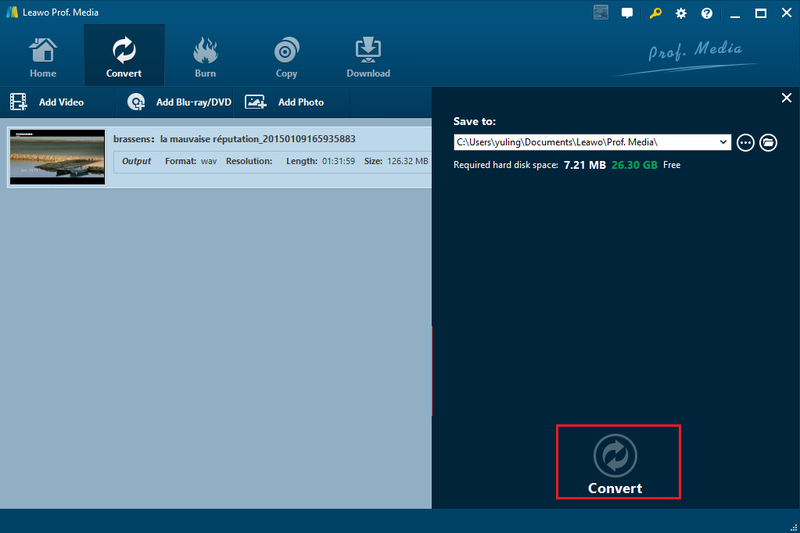 Click Convert to remove DRM from the M4A music files and convert the DRM-free file to MP3 afterwards. The green progress bar will show the completion status in real time. Once it is done completely, you can transfer the music files to other devices for unlimited enjoyment or convert them to other formats for enjoyment. From the above section, we have DRM-free M4A files ready, and now we can proceed to convert these files to WAV for streaming the audio files on Windows. 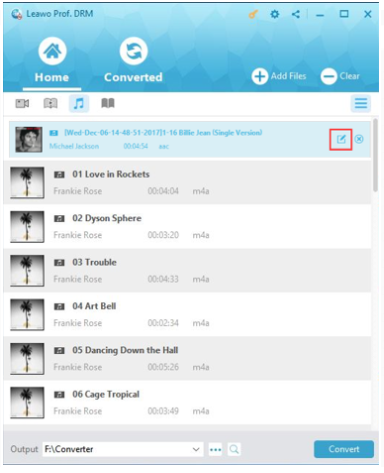 Leawo Video Converter is the best tool to convert files of different formats. More than 180 formats are supported in this program, and 6x faster speed is guaranteed for users to convert files efficiently. Users are fully given the right to edit their files before conversion by utilizing rich editing features provided by the program. Here we can take a close look at the step-by-step guide on converting M4A to WAV. Step 1: Download and install this program. Click the button in specific system to download and install the program. Step 2: Transfer the DRM-free M4A music files here. Click Add Video or directly drop the files to the program. Step 3: Change the output format. Click on format drop-down list and hit Change. A Profile panel will be displayed to let you choose the target output format. Click on the Edit button from the format drop-down list. Set parameters such as bit rate, channel, and sampling rate for the audio file. Click OK to exit the setting page after all parameters are set. Step 5: Set a folder to store the converted file. Click the green button Convert on the toolbar and set a folder to store the converted file on the pop-up window. Then, hit on the Convert button below to start the file conversion process. Step 6: View the progress of conversion. 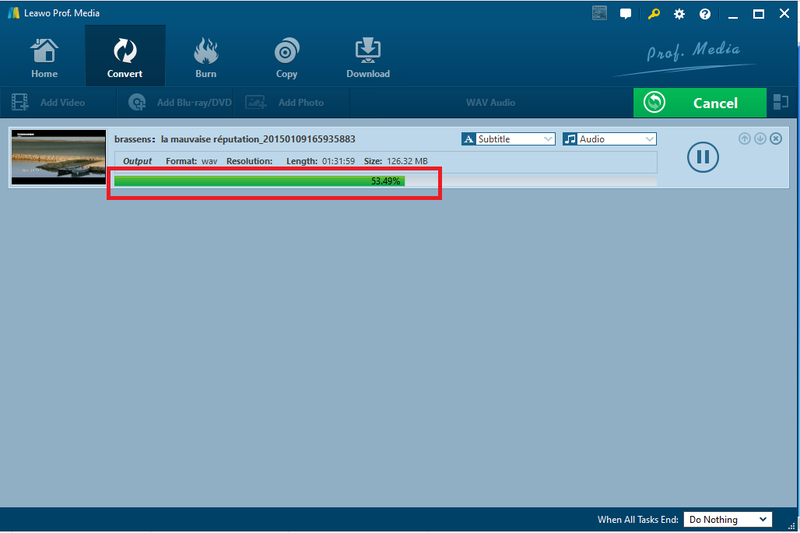 Check for the completion status of file conversion through the green progress bar. Once it is done, your WAV files will be ready for enjoyment. To sum up, to convert M4A to WAV, Leawo Prof.DRM and Leawo Video Converter will be of great help to you, both of which are professional and powerful. 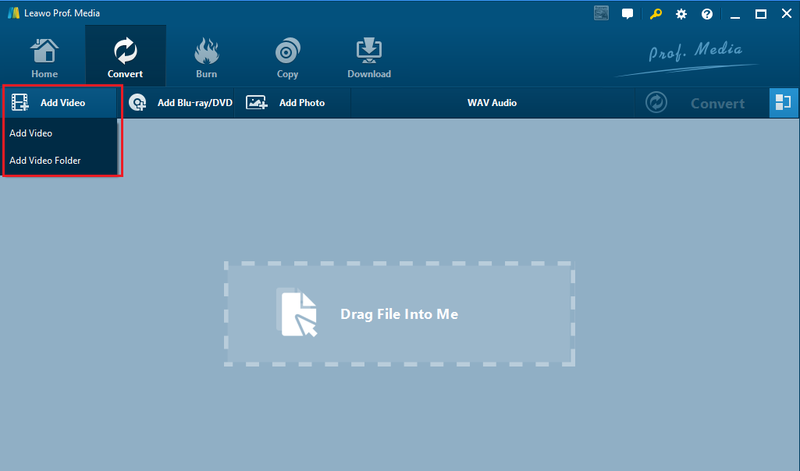 It will be extremely convenient and efficient for you to transfer M4A to WAV, as well as other file conversion demands. Don’t hesitate to give them a shot. If you want to removal other types of DRM , Leawo Prof. DRM can also help you . Refer to this guide share kindle books on iPad . How to Watch iTunes Movie on VR Headset? How to play iTunes movie on ASUS Phone? How Can I Play MKV Files on My Fire TV? How to Play Audiobooks on Garmin GPS Devices? How to Add Friends on Spotify With/ Without Facebook?